Since starting this site, we have been able to conduct dozens of trekking pole reviews from online start-ups to big name retail brands. One thing we have learned in this business is that price doesn’t always equal quality. Below are trekking poles that we recommend and have personally tested. Having such a wide exposure to different trekking poles, we feel that we can give a unique perspective of what constitutes a good trekking pole and what will probably be a good fit for you too. You’ll notice that the big brands like Black Diamond, REI and Leki won’t rank highly on our trekking pole reviews (unless we test them and are truly awesome). They make some good trekking poles at the higher price points but the poles below are just as good and often better at about half the price! Please note, this is not a ranking system. Look at each metric on the individual reviews and decide which is most important to you. Having said that, there are some brands that stand out above others such as Montem, Hiker Hunger and Bearios that have consistently impressed us in terms of quality and price. If you have any questions about these trekking pole reviews, please contact us and we are more than happy to answer any specific questions you may have! The top rated and best seller hiking poles are the Montem Ultra Strong Trekking Poles. These lightweight Montem Ultra Strong Trekking Poles are designed for all-season on-trail/off-trail versatility. The three piece, ultralight, narrow diameter aluminum shafts, reduce weight without sacrificing strength. Claimed to be built from the same form of aluminum used in airplanes, we gave it a test, and it definitely holds up with a sturdy weight bearing system capable of supporting roughly 350lbs of weight. Dual FlickLock pole locking mechanisms allow for easy length adjustment. Clamping force is adjustable allowing for customization down to the finest details. The poles also feature extended grips allowing for hand placement adjustments in uneven terrain. The Montem Ultralight 3K Carbon Fiber Trekking Poles are the latest addition to the top-rated Montem trekking poles. A new innovative 3K design fused with 100% carbon fiber allows for lightweight and compact hiking. A stylish new way to explore your adventures. The key is in the new 3K design — woven 100% carbon fiber that responds more naturally to pressure, allowing the poles to withstand even more force on your journey. The Montem 3K Carbon Fiber Poles weigh 7.8 ounces per pole so you don’t feel weighed down – you’ve already got enough to carry, your poles are here to help you, not hinder. These lightweight Black Diamond Trail Pro Shock Trekking Poles are designed for four-season on-trail versatility. The three piece, ultralight, narrow diameter aluminum shafts, reduce weight without sacrificing strength. Dual FlickLock Pro pole locking mechanisms allow for easy length adjustment and improved strength and clamping force. The poles also feature the patent-pending Control Shock Technology (CST) for progressive four-stage shock absorption. Looks like another great product from Montem Outdoor Gear! These Montem Ultralight Carbon Fiber Trekking Poles are perfect for hiking, backpacking, walking, mountaineering, snowshoeing, climbing, and all adventure travel. The three piece, ultralight, narrow diameter carbon fiber shafts, reduce weight without sacrificing strength. They were designed to be the strongest and lightest poles available made with 100% carbon fiber, creating ultralight poles that reduce vibration and retain strength over a wide temperature range. For the seasoned hiker who wants something beyond the ordinary for all their needs, the Leki Corklite Trekking Poles should be enough to get the job done. Apart from looking more fabulous than its cheaper counterparts, this product brings the reliability of Leki, a company that is dedicated to making the lives of thrill seekers easier. For those seeking the ultimate adventure, this product offers the same remarkable features as the standard version of Corklite but also includes the benefits of SAS-L Antishock for much greater comfort and seamless flexibility in the long run. These Bearios Carbon Fiber Quick Lock Trekking Poles feature a “Quick & Easy” lock for easy height adjustment so you can find your ideal pole length more easily than before no matter your height. The poles are made of 100% carbon fiber, making them some of the lightest trekking poles on the market. The main difference between these poles and others is their lower weight. Each pole weighs right under 10oz. and extends from 23” to 53”. Saving a few ounces on each pole may not sound like a lot, until you carry them all day! The Cascade Mountain Tech Carbon Fiber Hiking Poles goes from 23 to 53 inches; locking comes by way of a fast, lever-type system that is claimed to outlast twist-lock competitors. The poles are certainly engineered well, though they have a bit of a bulky feel (despite being one lightest poles we have looked at). The poles include extremely hard tungsten carbide tips and two kinds of rubber covers: standard round ones and angled ones with a tread on the bottom specifically designed for road and sidewalk use. These poles feature a “twist lock” for easy height adjustment so you can find your ideal pole length more easily than before no matter your height. The poles are made of 100% carbon fiber, making them some of the lightest trekking poles on the market. These Hiker Hunger Carbon Fiber Trekking Poles are perfect for hiking, backpacking, walking, mountaineering, snowshoeing, climbing, and all adventure travel. They were designed to be the strongest and lightest poles available made with 100% carbon fiber. To adjust your 3-section poles, simply flick the lock open, set the length and flick the lock closed – a quick, tight, and easily accomplished task, even while wearing gloves. The carbon composite creates ultralight poles that reduce vibration and retain strength over a wide temperature range. The High Trek hiking poles can be adjusted in length from 26″ to 53″ by unlocking their “Twist-Lock” mechanism which is built to quickly adjust while preventing accidental retraction. The hiking poles come with mud/snow feet which quickly attach to the bottom to prevent the poles from sinking into softer material. These trekking poles are collapsible and weigh only 11 ounces and retract to 26″ they are easily stored when not in use. The High Trek poles perform at their best in moderate conditions; they’re not designed for “extreme” outdoor challenges. These poles are suitable for men and women. The JESBAN/VOROSY Carbon Fiber Trekking Poles can be adjusted in length from 24″ to 52″ using their flip lock system. he poles are made with 80% carbon fiber weighing approximately 0.45 lb each. They are super light but sturdy, suitable for most shapes. The handles are coated in a foam material that makes for easy gripping even when your hands are sweaty. After a while though, it gets uncomfortable. Each pole also has very an anti-slip hand strap as well. Moving onto the ends of these poles, each has tungsten steel tips so you get an amazing grip on any terrain. JESBAN trekking poles are what many would consider ideal entry-level / semi-pro equipment. 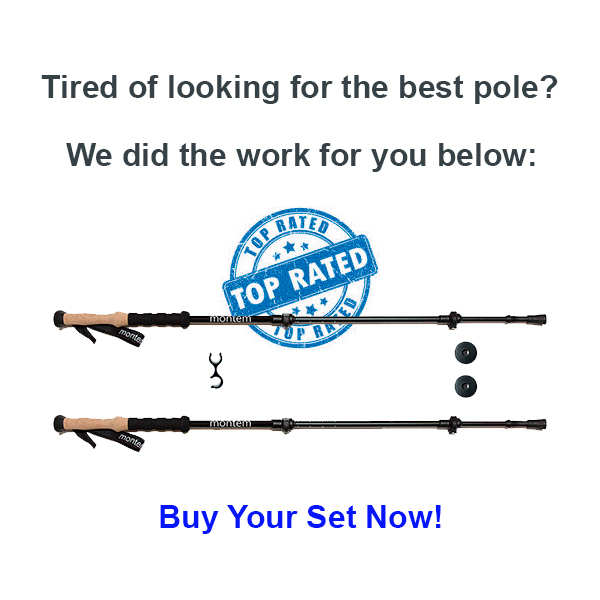 They’re great for those who want to try decent poles without spending a lot of money. Trekking poles and hiking staffs are standard equipment for many walkers, hikers, trekkers, backpackers and snowshoers . The reasons why are simple: They enhance your stability and provide support on all types of terrain. The maximum length of these poles is generally around 54 inches and often, they can even be conveniently attached to a backpack when not in use which makes them simple to carry out. Usually made from either aluminum or carbon fiber, they are lightweight and may even feature spring-loading to help avoid wrist strain. Hiking poles are actually a next generation walking stick and are used for the same general purpose – to support movement and to gain a rhythm. While they may not necessarily be required on flat surfaces, some hikers choose to use them to improve the amount of exercise they obtain, but they really come into their own on rough terrain or on steep slopes where the hiker’s stability is improved. They are useful for negotiating rocks or boulders and can even be used to test the depth of water or mud and are especially useful when used in conjunction with snowshoes. They are even some advanced trekking poles which can be used as tent poles or to set up a Bivouac shelter with a backpacking tent. Trekking poles and hiking staffs will not decrease your overall energy expenditure since you’ll be using your arms more than you would when walking without poles. They do, however, help distribute your energy usage in a way that can help your hiking endurance. Trekking Poles: Sold as a pair and used in tandem, trekking poles enhance your stability and can reduce force on your knees while hiking and backpacking . Most are adjustable in length and some include internal springs that absorb shock to further reduce impact. Hiking Staff: Sometimes called a walking staff or travel staff, this is a single pole that’s most effective when used on relatively flat terrain and with little or no load on your back. Hiking staffs are adjustable and some include a shock-absorbing feature. They may also include a built-in camera mount under the handle so the staff can be used as a monopod. Adjustable: Most trekking poles adjust in length to enhance stability on different terrain. They generally adjust from about 24 to 55 inches long. Typically, you will want to shorten the poles when going uphill and lengthen them when going downhill. Shock-absorbing poles: These offer internal springs that absorb shock when you walk downhill. With most poles, this feature can be turned off when it’s not needed, like when you’re walking uphill. Shock absorption is recommended if you have weak or damaged ankles, knees or hips. It adds a bit to the cost of the poles. Standard poles: These do not have a shock-absorbing feature and are lighter and less expensive as a result. While they don’t absorb as much impact when going downhill, they do provide a similar level of balance and support as shock-absorbing poles. Ultralight: Ultralight poles offer the advantage of less swing weight, which makes them easier and quicker to move. Over the course of a long hike, this means less fatigue. Ultralight poles are also easier to pack. The pole shaft’s material is a key determinant of the pole’s overall weight. We classify ultralight poles as those that weigh less than 1 pound per pair. Accessory mounts: Some trekking poles and hiking staffs include built-in accessory mounts such as a camera mount under the handle, enabling the pole to be used as a monopod. Trekking poles are identified by their two or three interlocking sections that allow for adjustment in length. This adjustability (which typically ranges from 24 to 55 inches) lets you adapt the poles to your height and the terrain. Locking mechanisms are used to secure the poles at your desired length and keep them from slipping while in use. Push-button lock: Poles with this locking mechanism snap into place and lock with a single pull. Press the push button to release the lock and collapse the poles. The pole’s shaft makeup is a key determinant of the pole’s overall weight. Carbon fiber: The lighter and more expensive option, these poles average between 13 and 18 ounces per pair. They are good at reducing vibration, but under high stress, carbon-fiber poles are more vulnerable to breakage or splintering than aluminum poles. If you hike in rugged, remote areas, this is something to keep in mind. Cork: This resists moisture from sweaty hands, decreases vibration and best conforms to the shape of your hands. Rubber: This insulates hands from cold, shock and vibration, so it’s best for cold-weather activities. However, it’s more likely to chafe or blister sweaty hands, so it’s less suitable for warm-weather hiking. Wrist straps: Most poles allow you to adjust the length of each strap in order to get a comfortable fit. Models with padded or lined straps can prevent chafing. Trekking poles go by many names, and may sometimes be called Walking Poles, Hiking Poles or even Hiking Sticks. As you might expect from the name, trekking poles are long sticks which are used by many people as a hiking accessory to facilitate their ability to walk over rough terrain while helping them to maintain a rhythm to their movement. Similar to ski poles, trekking poles feature a basket at the base as well as wrist straps and padded handles. However there are some subtle differences to ski poles, primarily because they are actually retractable, being formed from either two or three sections and can therefore be either collapsed for ease of storage or transportation or extended whenever required. The maximum length of these poles is generally around 54 inches and often, they can even be conveniently attached to a backpack when not in use which makes them simple to carry out. Usually made from either aluminum or carbon fiber, they are lightweight and may even feature spring-loading to help avoid wrist strain. Hiking poles are actually a next generation walking stick and are used for the same general purpose – to support movement and to gain a rhythm. While they may not necessarily be required on flat surfaces, some hikers choose to use them to improve the amount of exercise they obtain, but they really come into their own on rough terrain or on steep slopes where the hiker’s stability is improved. They are useful for negotiating rocks or boulders and can even be used to test the depth of water or mud and are especially useful when used in conjunction with snowshoes. They are even some advanced trekking poles which can be used as tent poles or to set up a Bivouac shelter with a backpacking tent. Pole Adjustment: Most of the best trekking poles have a mechanism which enables them to be extended or shortened as required. Pay attention, when shopping for trekking poles, to the type of mechanism that is employed by your chosen poles. For example, lever lock action poles are usually considered to be much more robust and long lasting than twist lock products and they are also quicker and easier to operate. The lever lock is actually rapidly becoming the most popular mechanism for modern trekking poles, so you should have no trouble in finding them. Design And Sections: You can choose from three popular designs of trekking poles including telescopic two section poles, telescopic three section poles and folding versions, so you need to be aware of the advantages of each. Although two section poles are stiffer, they are also stronger, so are good for those who require a more robust product, for example for snowshoeing. The downside is that they don’t fold down to as small a size as other poles and can be awkward to carry. A three section pole is the easiest to find and is also the smallest size for easy transportation. Simple to fit to a backpack or inside a bag, these are ideal for backpackers and for those who enjoy mountaineering, but they are not as strong or resilient as a two section variety. Folding tent poles are a relatively recent addition to the market and are very light and compact, but not very strong or robust. They are also often up to 14 inches shorter than standard poles and are really only suitable for light to moderate use such as cross-country travel or backpacking on trails. Material: If you choose aluminum poles you will be getting a heavier but more resilient product to damage than if you choose carbon fiber, lightweight pole. Shock Absorbers: Some trekking poles feature shock absorbers to reduce wrist strain, although some hikers complain that they reduce stability. Handle Type: The type of handle you choose will be based on personal preference. You could opt for cork handles, which will mold to the shape of your hand, but may feel sweaty after some use, rubber grips, which are better for cold environments, foam grips which reduce chafing and are more lightweight. Ease of Transportation: If portability is important to you, you should choose poles which can be easily folded and attached to a backpack. Versatility: If you are planning on using your trekking poles in a number of different environments you will need to think about the versatility of your chosen poles. A pole that is suitability for the majority of outdoor activities is better value for money than one which is really only of use for snow activities or for lightweight trails if you are planning on adapting it to a variety of terrains. If you are looking to increase your speed while walking and hiking, trekking poles can assist you. By enabling your arms to assist in propelling you forwards and upwards, trekking poles boost speed whether on flat terrain or steep ground. Trekking poles can help to protect the joints, especially the knees, by reduce the compressive impact on the legs, ankles and feet. This is most prevalent when going downhill. While hiking in wooded or overgrown areas, trekking poles are extremely useful for pushing aside bushes or thorny plants or removing undergrowth from underfoot to improve comfort and ease when walking. To improve your rhythm while walking, you can use poles to maintain consistency and boost speed, especially on flat terrain. If you are moving on slippery surfaces such as wet rocks, snow, mud or loose rubble, trekking poles can help to give you extra traction and grip. If you are crossing challenging terrain such as river crossings or tree roots, trekking poles can help you to negotiate the area more quickly and with increased balance. If you need to cross mud, sand, snow or water, trekking poles can perform the function of a probe to test the depth of any obstacles for safety. If you are attacked by any kind of wildlife, trekking poles make a useful defensive weapon. You can make yourself appear bigger and fiercer by swinging them above your head. You can help to alleviate the weight that you are carrying in the form of backpacks etc by leaning on your trekking poles which you are resting. Trekking poles can perform multiple functions. For example, if you choose the lightweight folding type, there is no need to bring tent poles when backpacking as you can use your trekking poles for the same purpose. As trekking poles are designed to be more robust and strong than standard tent poles, you are also less likely to suffer from breakage during high winds so your shelter will be safer. If you suffer from an accident, your trekking poles can even be a medical splint and can even be paddles for a raft. Using trekking poles can lead to added energy expenditure as you are using your arms more than would generally be required during normal walking or hiking. This can lead to you becoming tired much more quickly and covering less terrain. Some users complain that trekking poles can actually be more trouble than they are worth because they have a tendency to get tangled up in trailing shrubbery or plants or trapped between rocks. This can lead to taking extra time to cover ground and can be irritating and time-consuming. Holding trekking poles in both hands means that your hands cannot be used for other things. Although this may not be a problem some of the time, it could be troublesome if you trip or slip and need to use your hands to break your fall. If you choose one of the heavier and longer two section trekking poles you may find that it is difficult to store and carry your poles when they are not in use. If they cannot conveniently fit into or be attached to a backpack, you will have difficulty in transporting them around. Some frequent users find that they actually experience more pain from using trekking poles than they did before they started using them. Elbow pain is one of the more common complaints from over-use and those who use the shock-absorbing poles also often problems. If you are thinking of using trekking poles there are several things to consider. Firstly, you need to think about the type of terrain that you will be trekking on. If you primarily walk in snowy regions with snoeshoes or over ice you will need a different type of walking pole to someone who only needs lightweight support on flat surfaces such as backpacking trails. You will need to do some research into which are the best and most suitable poles to match with your chosen hiking environment and choose accordingly. Secondly, how much can you afford to spend? Although, as you might imagine, the best quality trekking poles are those at the higher end of the price spectrum, there are also many excellent options that are at lower price points and are affordable even for those on a budget. Nevertheless, you should still aim to spend as much as possible to ensure that you are purchasing a product that will enjoy a long lifespan and that will be unlikely to be easily damaged or broken but will be suitable for use for many years to come. Thirdly, what kind of features do you require from your trekking poles? If you are only planning on using your trekking poles only occasionally and on non-challenging terrain, you may just require a basic pair with very few features whereas if you are planning on trekking across a range of different terrains or on very difficult ground, you may benefit from a pair with the most advanced features. If, for example, you are planning on cutting down your carrying weight for long overnight backpacking trips, you will need a small folding, lightweight pair. If you are planning on using your poles frequently in snowy conditions, you will require a robust and resilient pair. If you are planning on using your poles on mountainous terrain, you may want to think about shock absorbing poles. Fourthly, will you benefit from trekking poles at all? Although trekking poles have become a bit of a fashion accessory for outdoor enthusiasts, you may not need a pair at all unless you are planning on improving your rhythm and speed, trekking across rough terrain or require extra stability and support when walking. Not everyone likes the experience of using trekking poles, so you could borrow a pair from a friend to try them out before investing in your own if you are at all concerned about getting good value for money. Overall, many people like the experience of using trekking poles across a range of terrains and find that it improves their performance, boosting their speed and stability. As they are also useful for probing surfaces for safety and removing obstacles from obstructing the path, they have multiple uses, and with their many modern advanced features, such as the super-lightweight folding mechanisms which allow for easy transportation and even the ability to use them as tent poles, it is easy to see why they have become so popular. If you think that you could benefit from using trekking poles during your hikes, this article will help you to make an informed choice about which are the perfect poles for you. This is a remarkably thorough review, clear language – just the thing that a beginner like me needs! Thank you for all this info. I bought a pair and they have been really helpful getting me out to do some “real” walking after a full hip replacement. Thanks for these tips. I just bought a pair of the Montem Ultra Strong trekking poles. You will enjoy these, they are still one of my favorites.